St Benet was a superb Northern Saint. His full name was Benedict Biscop, sometimes known as Benet Biscop. He was born in Northumbria in 627 AD. As a young man he served in the court of the Northumbrian King, Oswin. At the age of 25 he went on a pilgrimage to Rome. He made a second visit there some years later. On his return journey he visited the great abbey of Lerins where he stayed and became a Benedictine monk. After some years he returned to England and became abbot of a monastery in Canterbury. St Benet enjoyed his time in Canterbury but in 672 AD he returned to the north of England where he founded the monastery of St Peter’s, Monkwearmouth in Sunderland. This land was given by Egfrid, King of Northumbria. 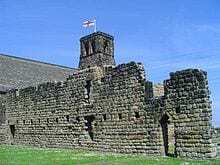 In 682 AD the king was so delighted at the success of St Peter’s, he gave Benet more land in Jarrow and urged him to build a second monastery. Benet erected a sister foundation called St Paul’s, Jarrow. Benet brought workmen from Francia (Latin name for France) to build these churches. These churches were the first ecclesiastical structures in Britain built of stone, and furnished with stained glass windows, pictures, service books and the library he had collected on his travels. Benet introduced stained glass into this country as stained glass windows were unusual in England at this time. Benet himself was the first abbot, and the monastery flourished under him and his successors, Eosterwine and Ceolfrith for two hundred years. 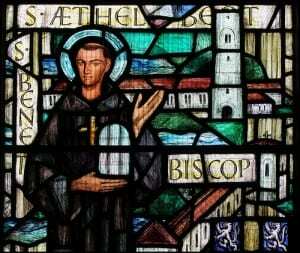 Benet left England for Rome in 686 AD but before doing so he established Ceolfrith as abbot in Jarrow and Eosterwine at Monkwearmouth. Before Benet died, he stipulated that the two sites should function as ‘one monastery in two places’. We celebrate the life of St Benet on his feast day, 12th January; the day he died in 689 AD.